Romitaman Original Comic Book Art :: Private Collection :: Amazing Spider-Man 147 Cover (OVER-SIZED) 1975 SOLD SOLD SOLD! by artist John Romita Sr.
Click Here To See Amazing Spider-Man #147 Comic Book! 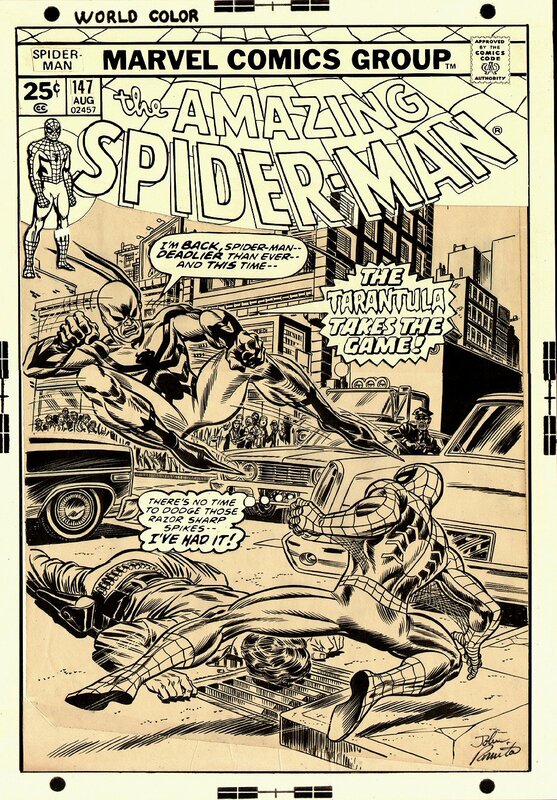 Check out this stunning OVERSIZED 1975 Amazing Spider-Man cover which was penciled and inked by the great John Romita, from the story titled: "The Tarantula Is A Very Deadly Beast!" 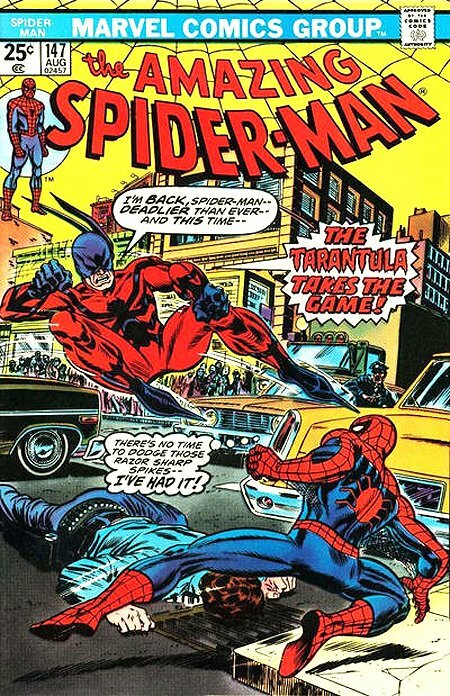 This stunning cover features John Romita The Amazing Spider-Man as he tries to save an unconscious police officer, as the Tarantula leaps to kill Spider-Man with his poisonous spikes! This cover was drawn on vellum which has slightly yellowed over time. This cover is actually LARGER than most other Amazing Spider-man covers from this era! The actual top of logo to bottom of drawn cover area measures 11.2 by 16.4 inches tall on a 12.2 by 17.8 inch art board. The logo and word balloons were all reconstructed and match the artwork perfectly. The logo and word balloons were all placed onto an acetate overlay which can easily be lifted up to show ALL of the great drawn artwork underneath. Cover is signed in the lower right by John Romita in his older "SCRIPT" signature, which is rare to see nowadays! If you want a super detailed John Romita Amazing Spider-Man cover without breaking the bank...THIS ONE IS FOR YOU! With small art Romita ASM covers approaching 100k+ in the not too distant future, Don't pass up this 1 if you can help it! Compare this nice cover art to the published comic book in the red link above! ALL HIGH end pieces of art, including this one, are able to be purchased with VERY fair time payment plan options, and trades are always considered towards this and "ANY" art on our website! Just send us an email to mikeburkey@aol.com and we can try to work something out.